On Sky News yesterday Adam Boulton reported David Cameron as (metaphorically) paying ˈhɒmɑːʒ to various Middle Eastern rulers (ones still in power, that is). I wonder if this was just his fancy way of pronouncing the word homage. This word was borrowed from Old French into Middle English some eight hundred years ago and is usually pronounced ˈhɒmɪdʒ. Or was he consciously reborrowing the modern French equivalent, hommage? If the latter, then you would expect him to know that French h is silent. In French the word is pronounced ɔmaʒ. As experts on French will tell you, words spelt with initial h- fall into two classes phonetically. Some have the so-called “h aspiré” (aspirated h), which is unpronounced as such, or might sometimes be realized as a glottal stop; but in any case it blocks liaison that would otherwise occur. Others have “h muet” (silent h), which is equally unpronounced but allows liaison. For what it’s worth, the one in hommage is h muet. As is well known, English has restored an h-sound in the pronunciation of many French loanwords (e.g. habit, heritage, hospital), though not in all (not in heir, honest, hono(u)r, hour and their derivatives). For herb the h has been restored in BrE but not in AmE. In BrE hotel there are a few laggards who have not yet restored the h, though most speakers pronounce it (except of course those who drop h anyway). You’ll also know about humble and (h)ostler. Let’s not get into h in unstressed syllables (historical, heretical, hysterics). An awkward case is the visibly French loanword hauteur. In French it’s otœʀ. In BrE it may be pronounced as in French, or more likely in some such halfway anglicized form as əʊˈtɜː. That’s what you’ll find in LPD and CPD, without any restoration of h. But I notice that ODP gives an alternative hɔːˈtɜː — I can’t say I’ve ever heard this myself. In AmE I think the h tends to be restored insofar as the word is used at all. The problem with having no h-sound in hauteur is that it makes it a homophone of auteur. I suppose there might just about be a misunderstanding if one referred to the (h)auteur in a discussion of some cinéaste’s oeuvre. But then of course they’re homophones in French anyway. If we wanted to anglicize hauteur really thoroughly, perhaps we ought to spell it haughteur (or perhaps haughture, attested in the sixteenth century), like its cognate haughty, where the h-sound has been firmly restored. The spelling with -gh- is nevertheless etymologically entirely unjustified, being attributed by the OED to the influence of caught, taught and perhaps high, height. 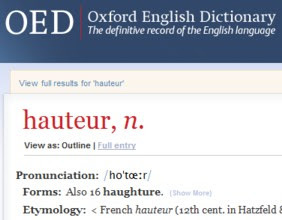 The OED’s take on the pronunciation of hauteur is a strange mixture of French and English (o is meant to be “as in French eau”, while œ is “as in boeuf”). I think we are going to have to get used to the frenchified version of 'homage', I never hear anything else through the TV. I get the impression that Americans tend to have an h-less 'human' too. Can anyone confirm or disconfirm that? In American English, the h is often dropped from hj- words such as "humour", "huge", "Hugh". Living in an area in which h-dropping is very common, I find that these hj- words are least likely to have an h dropped in British English (leaving aside that it may be more like [ç] than [h], as in other areas). I believe that "humour" and "Hugh" take an h muet in French, which might explain the American situation. I don't know whether "huge" has any French origins. Pronouncing hom(m)age as a foreign word seems to have been a commonplace among film critics for some time. It means (I think) the process or the product of copying some aspects of another director's style as a mark of respect and an acknowledgement of influence. Within that narrow circle it was easy to maintain something like an authentic French pronunciation. Now the word has 'got out' into the mainstream, fewer speakers who use it are aware of the disconnect between spelling and sound. More to the point perhaps, listeners expect the sound to match the spelling. Perhaps Adam Boulton made a conscious decision to add that h to make life easier for his listeners. I'm sure the French-ified pronunciation of homage comes not from mimicking the French but mimicking American English. I've never heard it pronounced by an American any other way than ˈhɒmɑːʒ. And the kinds of people who use it at all ( directors, artists, arts reviewers, actors etc ) are, by the nature of their work, heard by a wide audience. @ Ed: "In American English, the h is often dropped from hj- words such as "humour", "huge", "Hugh"." I think that's a Northeast thing. Maybe you've been hearing speakers from that area. @ Paul: "I get the impression that Americans tend to have an h-less 'human' too. Can anyone confirm or disconfirm that?" Again, I only hear this from people from the Northeast. "I think we are going to have to get used to the frenchified version of 'homage', I never hear anything else through the TV." I do agree with you on that though. This really annoys me too. Ed: In American English, the h is often dropped from hj- words such as "humour", "huge", "Hugh". Phil: I think that's a Northeast thing. I think that dropping /h/ before /ju/ is an idiolectal rather than a dialectal feature. I live in Boston and have not noticed it occurring frequently. The one person I know who distinctly drops the /h/ before /ju/ is a native of Chicago. Thomas: I've never heard it pronounced by an American any other way than ˈhɒmɑːʒ. Are you sure about that [ɒ] in the first syllable? Most Americans have no such vowel (no LOT–PALM contrast), unless you mean the vowel of THOUGHT in speakers who have a LOT–THOUGHT contrast; but I don't believe many such would use THOUGHT for a letter "o" in that position. I grew up in Seattle, and everybody from whom I heard the word there--chiefly Reform rabbis reading from the old Union Prayer Book--pronounced it ['ɑmɪdʒ]. I asked a gentile friend how he pronounced it and he said it the same way. @ Phil: At the risk of trying to sound superior, I have to say that this changing pronuciation doesn't annoy me. If I got worked up about every pronunciation that wasn't the same as my own, the stress would kill me. Perhaps this type of change has more annoyance potential because we might interpret it as the speaker putting on airs and graces - making a simple English word sound 'fancy'. Being a relative youngster, I could predict that in a few years the situation will be the same as with 'niche' - people will be condemning the traditional British 'nitch' pronunciation as an awful Amercanism, because everybody knows it's supposed to be pronounced 'neesh'. That's a 'debate' I'll be staying out of! As far as I am concerned, there are now two separate words spelled homage, the older /ˈɑmɪdʒ/, the feudal ritual and metaphorical versions of it, and the newer /oʊˈmɑʒ/, defined as David Crosbie does, but extended to all the arts, not just film. Neither of them has /h/. Ah, I think I see. So /niʃ/ is a popular innovation in Britain, and AmE is retaining the older pronunciation? That would make more sense of Paul Carley's remark, to which I was responding. But what Adam Boulton meant was old-fashioned 'homage'. 'Hommage' is surely still quite inappropriate, As you imply yourself, the distinction has been well established for some time. So if he did add the h, he either added it to the wrong word, or mispronounced the -age of the right one, which to a lot of us does present a problem, however happy we are with ɑː(d)ʒ in 'garage' etc. What has happened is that it is the inappropriate pronunciation, rather than the spelling, that has "got out", as you put it, before this well-established distinction had even "got into" the dictionaries: 31 online dictionaries or encyclopaedias only list "homage" (Hutchinson even giving the alert "Spelling: note the single m"), most of them only recognizing the pronunciation ˈhɒmɪdʒ etc, ± ˈɑmɪdʒ for AmE, and NONE recognizing the Frenchified one. Urban Dictionary specifically reviles it. Only 7 online dictionaries or encyclopaedias list "hommage", most of them just redirecting to 'homage' or saying "alternative spelling of 'homage'". Wiktionary and Webster's New World College Dictionary, 4th Ed., both give your 'artistic sense" for hommage, the former with the pronunciation oʊˈmɒːʒ for it, as well as for 'homage' used in that sense. That pronunciation almost seems intended to parody the fanciness of both usages, and the improbability of any awareness that oʊˈmɒːʒ does not reflect the French spelling and pronunciation which determine that sense. The Wiktionary entry for 'homage' gives a link to a Ben Zimmer article 'Homage', "On Language", The New York Times, November 5, 2010. He gives an amusing quote from “The Accidents of Style,” Charles Harrington Elster, calling oʊˈmɑːʒ a “preposterous de-Anglicization” that is “becoming fashionable among the literati.” But what objection can there be to ɒˈmɑːʒ, ɔˈmɑːʒ etc for this French 'hommage' if only it is kept distinct and gets recognized by the dictionaries? I hope that you will now be able to see both my previous posts: as far as I too am concerned, there are now two separate words, but I don't think it's as simple as their both being spelled 'homage'. The older ˈɑmɪdʒ/ˈhɒmɪdʒ (and also long pronounced with the h, even in NAm), spelt 'homage' and (by lexicographical conventions at any rate) misspelt 'hommage', and the newer oʊˈmɑʒ, an unfortunately orotund pronunciation of ɔmɑːʒ or its usual Anglicizations, spelt 'hommage' and (again by lexicographical conventions at any rate) misspelt 'homage'. I see you pronounce nɪʃ as I do, but I also see that LPD3 doesn’t list it. I think that must be by an oversight, as it lists the plural with nɪʃ- for BrE. Like John Cowan, I have the same dual pronunciation for homage, a version of Fr. hommage for the auteur stuff and a version accented on the first syllable for the feudal stuff. In NYC people have much more occasion use to the auteury meaning and pronunciation than the feudal version. People's body language generally makes clear that the word is not really part of their active vocabulary, but it's the way they would verbalize the concept if they spoke that way. Is -mɒːʒ a typo for -mɑːʒ in Wiktionary? Probably, Steve, but you take my point, I trust. @ Paul: I don't think you're trying to sound superior. This pronunciation doesn't really annoy me that much. I tend to overuse the verb "annoy". I should try to choose my words more carefully in the future. "Perhaps this type of change has more annoyance potential because we might interpret it as the speaker putting on airs and graces - making a simple English word sound 'fancy'." Exactly. Of course I realize that this may not always be the case though. John Cowan wrote: "As for niche, I doubt if /niʃ/ is truly the predominant AmE pronunciation." Yes, I say /nɪtʃ/ and I'm not ashamed to admit that. I guess that makes me a stupid American. And I'm not afraid to admit that I grew up only ever knowning the 'neesh' version and that I too thought that the Americans were up to something odd until I learnt better. The same goes for 'zebra' with FLEECE and 'Caribbean' with stress on the 2nd syllable. I sometimes point out to bigoted Brits that until relatively recently the UK (or at least RP) version was the same as the present US version. Which by lay logic would mean that we've done the 'spoiling', not the Americans. I believe there's a chapter by J Algeo in Bauer and Trudgill's 'Language Myths' devoted to the blame-it-on-the-Americans approach to language change. It's called 'America is ruining the English language'. I read the book a long time ago and no longer have a copy. Looks like an interesting piece. Shame I can't remember it! @ Paul: Yes I've heard of that book and I've read some of it online. Most Americans seem to believe we're ruining the language as well. I don't think we are, but it's impossible to convince my fellow countrymen of this. Here is a very informative essay I read a while back about this topic (not that you need to read it). The author uses the term British when he's referring to specifically English features (which seems to be a common American thing to do for some reason) and he also makes it sound as if all "British" people have the TRAP-BATH split, but besides that it's pretty good. I don't know if it was written for fellow linguists anyway. I'm sorry this is so off topic everyone. At least it's related to linguistics in some way. Rendons nos hommages au fromage.